Natural pasture is the best food for cattle. How odd it is to have to repeat this. It seems so obvious, that people tend to forget it. Cows get from it all they need to build up their immune system, all the proteins they need for their body and the milk to feed the veals. Here, under the Tropic of the Capricorne, near Salta, North West of Argentina, it only rains during the austral summer months: December, January, February. That’s it. In three months we get 1000 to 1500 mm, approximatly what Brussels or Brest, gets in a whole year. Summer in the Tropics is also a time when the sun is vertical right up your head, the nearest from earth. These spectacular conditions give record growths to the grass. In general the balance between proteins and sugars (fibers) is achieved just when grass flowers. This is about the right time when you can harvest and get well balanced food for winter. Naively, we could think that corn would be better and give bigger crops… it is just the contrary. First corn is not the best food for cows, it brings too much quick sugars which turn into quick disapearing fat or milk without making muscle. Second in our field we get crops of 8 to 12tons/hectare corn as with pasture we reach 20 tons to even 40 depending on the areas. This without having to seed, work on the soil, fertilize, herbicide, nothing… just harvest. I still dont understand why people continue to grow corn to feed cattle? and above all this single food diet based on corn is nothing in comparison with a diversified meal, mixing all kinds of nourrishing and medicinal plants; a true balanced meal. But to be able to use hay all winter, it needs to be dry; almost mpossible when it rains 2 hours everyday. We need to find a solution. The solar barn. The roof to protect against the rain is turned also as an oven to heat the air, which is then propelled under the wet thatch to dry it slowly. The hay is brought in and distributed by a mechanical fork, which then brings it, once dryed up, to the machine which makes the rolls. Then the rolls are kept in the other part of the barn to be then distributed where the cattle are. Here we are talking of 7 000 heads to feed in winter when the grass does not grow anymore, on a surface of about 40 000 acres dedicated to grazing. Which means a lot of kilometers to drive and distribute the rolls everywhere. 500 m3 of grass can be dryed every week, about 200 rolls. In 10 weeks the barn is filled up and we need to get rid of the rolls and distribute them all around. This is how it works : the air enters the roof to be heated and expelled under the wet grass. The humid air is then expelled out on the top of the roof. A little thermodynamics is needed to calculate the flux of air, so that it does not burn the thatch and that it can stay at about 10°C above outside temperature. At midday, the strengh of the sun gives 15kW/m2, a lot. The speed of air must adapt to it. 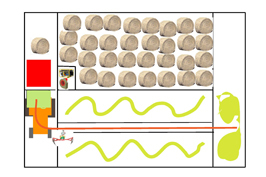 The only disadventage of this barn, is that it depends on machines, a powerfull fan and a big fork, running back and fourth, on its’ 30meters long rail… it needs too much electricity to be produced by solar power, it would be too expensive. The machines run on a power generator with diesel. This is why we started our plan to produce biodiesel with micro algaes feeding on agriculture waste… The nearest gas station is 2 hours away by car. This entry was posted by admin on Sunday, September 27th, 2009 at 2:14 pm. It is filed under Soil & agriculture and has these tags: algaes, argentina, biodiesel, dry, hay, salta, solar barn. You can follow any responses to this entry through the RSS 2.0 feed. You can skip to the end and leave a response. Pinging is currently not allowed.